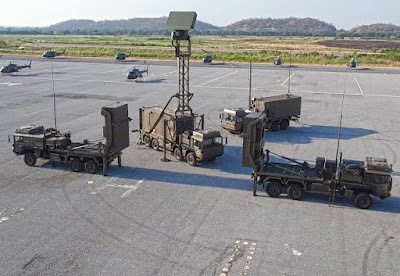 MBDA VL MICA ground based air defence missile of Royal Thai Army include wheeled self-propelled Airbus Defence and Space TRML-3D/32 3D radar, control station and two launcher with four missiles per each system. According to the Air Defense Command Unit, the Royal Thai Army has received an air defense system, weapons to release the ground to air VL MICA Europe in 2018, to replace the ground-to-air missile launching system, the Italian Spada that was stationed at the artillery battalion to the 6th aircraft Air Combat Artillery Brigade. Lastly, there was a photo revealing the VL MICA, which includes the entire system, firearms launcher, introducing 2 self-propelled artillery systems, command and control systems, and radar detection and air defense 3D Airbus Defense and Space TRML-3D/32-6 systems, including the system as one platoon VL MICA. Each system has a pipe 4 rocket launchers for missile launcher VL MICA RF Active Radar Homing or VL MICA IR-guided infrared trajectory 20km distance. If in the future we receiving sufficient budget, will provide one additional division from the company. Siguiente historia El misterioso accidente mortal del F-35: por qué peligra el mayor secreto militar de EEUU. Historia previa Indonesia ordena tres submarinos adicionales a Corea del Sur.